Now that Autumn has well and truly kicked in, it’s time to start thinking about storing your garden furniture away before the temperature plummets and the frosty mornings kick in. It can be tempting to leave your BBQ, plastic chairs and aluminium furniture outside (you can just clean it up in Spring, right?) but a harsh winter can damage even the hardiest of furniture. A little time spent now can save you a lot of time (and money) in the new year! And you’re right, they’ll fare better in the shed than outside in the elements, but they may still be exposed to damp, cold and insects/small animals. All of which might mean that your garden furniture isn’t as well protected as you think. Fear not though; follow our tips below and your garden favourites should be in tip top condition when you come to use them again next year! Don’t put your furniture away without a good clean first. Not only will it be in a better state when you come to get it out again next year, but dirt, birds droppings and mould can all damage furniture if left on over the winter months. Warm soapy water should suffice when cleaning most of your garden pieces, please be careful with wooden items though – a specialist detergent would be best here, or just warm water and a cloth. Before you store away your items, make sure that they have been treated. Whether it’s with varnish, wax or a lick of paint, not only will your garden furniture look lovely but it will protect the base materials from rust, rot and water that might creep into your chosen storage space. When storing your garden furniture, it is important to not just put it in your shed without any extra protection. Even the most secure areas may succumb to damp over the winter months. Make sure that you cover your furniture in tarpaulin when it is in storage, and wrap up your soft furnishings in separate, waterproof covers. Top Tip: Make sure your soft furnishings are thoroughly dry before storing, or you may be greeted by mouldy cushions and a bit of a pong next spring. We’d advise the you store your garden furniture in a covered, secure location. Whilst it can be tempting to cover it with tarpaulin and leave it outside, harsh winds and frosty weather may still damage it. Where you store your garden furniture will depend on what space you have at home. A shed, garage or outhouse will be your best bet if you have them, or a loft if it’s not full of all your other treasures already! 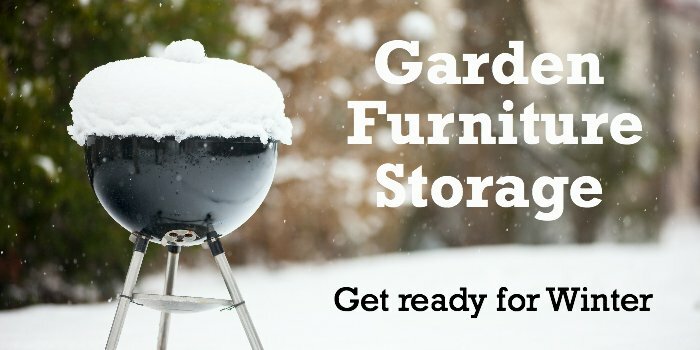 Failing that you could always rent a storage unit to keep your items out of harm’s way in the winter months. Follow these steps and your garden furniture will have the best chance of surviving the winter, ready to serve you next year. Do you have any top tips? Let us know in the comments below!